Another year is coming to an end. Per our tradition at SparkPost, we close it out with our holiday parties from coast to coast, and of course, our annual winter hackathon. This was my fourth hackathon with SparkPost, and it met the high standards set by the first three. I’m a big believer in our bi-annual hackathons. They give our amazing engineers a chance to tackle an issue or prototype a new feature or tool that they genuinely believe is important. The “Best in Show” winner gets to push their project to production. We’ve had some great features and fixes come out of it, including our A/B testing API, our Zapier integration, and HEML (by yours truly 😉). They are also a great chance to relax and get to know and work with people on different teams. My favorite addition to the hackathon this year was the Game Truck. I’m not much of a gamer, but I really enjoyed losing dozens of times at games that I’d never heard of. To be honest, though, I was more happy to see that I hadn’t lost my edge in ping pong. Along with pong, at SparkPost we love all things AWS. This year we added a new prize: Echo Dots for the most innovative use of AWS technology. Jason Sorensen and Jacob Kleidman won this, converting one of the more burst-prone areas of our API to be completely serverless using Lambda, Step Functions, Kinesis, Cloud9, and SageMaker. We had a fantastic lineup of projects this year focused on our five categories of Product, Tools, Partner Integrations, Fun with Data, and We Deliver. In the end, there could only be one. 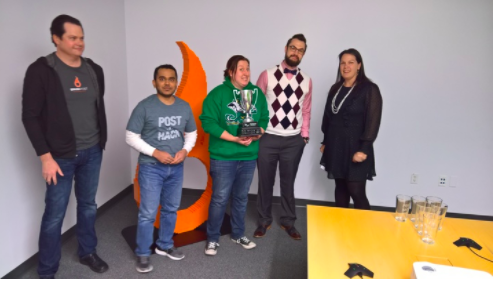 The winning team was (drum roll please) Threshold, with their impressive notification service for proactively notifying our customers about deliverability statistics. This tackles one of our most significant challenges, helping our customers be good senders and stay within best practices. The notifications will help them know if they are coloring outside the lines and help them hit the inbox. I can’t wait to see this implemented and, as always, there are a ton of new ideas floating around our offices for the next hackathon! Have an idea for our product? Feel free to tweet us! If you think this sounds fun, we’re always looking for new people to join our team!